These are sounds of animals which aren't people, birds, or insects. Remember, all sound clips are copyrighted to Doug Von Gausig, 1997. Non-commercial use is granted freely, but commercial use is expressly forbidden without prior written consent. Hear the Bullfrog Chorus! - that's right, a collection of 25 different Bullfrogs recorded in one 20 minute stretch at Tavasci Marsh (see the Bird Sounds Page)! This started out as an 8Mb file spanning 15 minutes of samples, which I trimmed down to just one croak from each different frog, then downsampled to 8000 samples/sec, then reduced resolution to 8 bit, leaving us with a 146K file! Remember, you heard it here first! Here is a sound that very closely resembles the rattler's rattle - and it's meant to! This is a sound made by the Bullsnake, or Sonoran Gopher Snake (Pituophis catenifer/melanoleucus affinus) when disturbed. The sound is made by a vigorous exhalation, followed by inhalation. He also shakes his tail at the same time, which can enhance the illusion that you are dealing with a rattlesnake. (16.8 sec, 83K, MP3) Here's a photo of him making this sound (JPEG, 200K). Another mandatory sound from Arizona is the Western Diamondback Rattlesnake (Crotalus atrox) (253K). This one was at the East edge of Tavasci Marsh, and was about 4 feet (1.2 meters) long, and 3½ inches (90mm) in diameter - a big guy! His warning was in plenty of time, and well-meaning. Rattlesnakes are an important part of the ecosystem, as they keep mouse and rat populations in check. They are almost never aggressive, and would rather escape than do any harm to a human. Mexican Free-tailed Bats are summer residents of central Arizona. They roost in very large colonies, sometimes numbering over a million! This is the species that also inhabits New Mexico's Carlsbad Caverns. While they roost, especially close to supper time, they talk amongst themselves. This is what we hear when they're just discussing the night's foraging strategy. 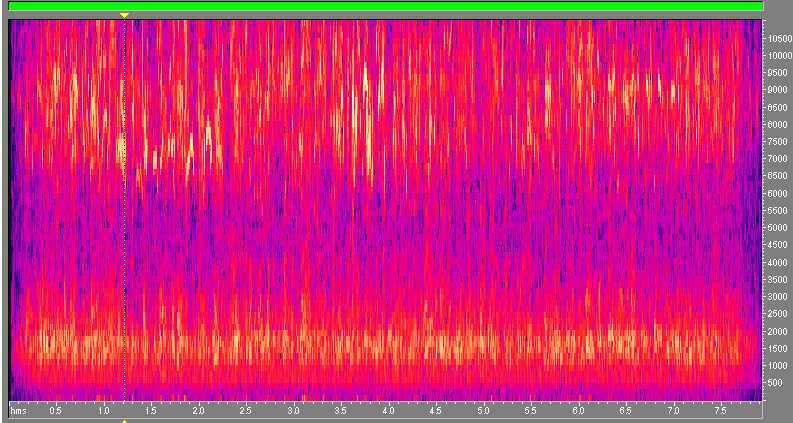 (170K) I noticed in the spectrogram of this file (click here to see it) that their vocalizations at roost are in bands - the lower frequencies occupy the 500Hz to 3000 Hz range and the higher-range vocalizing is in the 6000Hz to 20,000 Hz (the upper limit of my mic's sensitivity) range. There is a "gap" between 3000 Hz and 6000 Hz where there is virtually no sound. I'm unsure what causes this phenomenon, but I'm researching it. It could be that they use two diffferent mechanisms to produce the "low-range" and "high-range" sounds. I took the high-range sounds and digitally lowered the pitch by half, and here is what resulted (153K) - interesting! 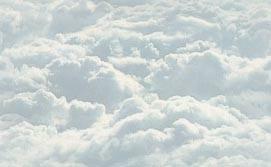 Here is an MP3 in which I slowed the same sample down to one-third normal speed - in it you can get a better idea of what's going on in all this chatter. By far the largest animal I have on these sounds pages is the Orca, or Killer Whale (Orcinus orca). These are the breathing sounds of members of the "L" pod of Orcas in the San Juan Islands. Listen carefully and you will hear first the explosive exhalation followed by the implosive inhalation. We know these are "L" pod whales because Kelly Balcomb-Bartok, of Sound Watch, came by to tell us all about them while we were observing. This was a wonderful example of an educational approach to wildlife conservation. Be sure to visit the Whale Museum in Friday Harbor, San Juan Island, Washington if you're ever up that way. They sponsor Sound Watch and do lots of great work to conserve and study the whales of the San Juans. This is a Chipmunk, probably the Gray-collared Chipmunk (Eutamius cinereicollis), recorded 2/28/99 on top of Mingus Mountain, Central Arizona. (46K). Gunnison's Prairie Dogs (288K) (Cynomys gunnisoni) are the subjects of a long-term study of animal communication by Dr. Con Slobodchikoff at Northern Arizona University. His study indicates that Prairie Dogs have distinctly different calls for specific predators in their territory. The call at the beginning of this paragraph is one they use when the see a domestic dog. When the threat is a human, they use this call (254K), and when it is a hawk, this is the call (232K) they use. To learn more about Dr. Slobodchikoff and his studies, visit his NAU web page at http://jan.ucc.nau.edu/~cns3/. To learn more about Gunnison's and other Prairie Dogs, visit the University of Michigan's Animal Diversity Web page for this species. All Audio samples on naturesongs.com are licensed under a Creative Commons Attribution-NonCommercial-ShareAlike 3.0 Unported License. Permissions beyond the scope of this license may be available at http://www.naturesongs.com/license.html.